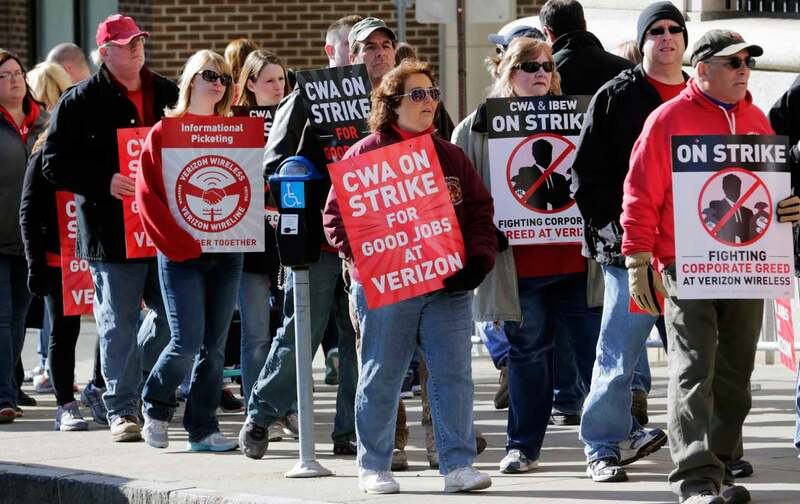 Can the strike at Verizon help kickstart the American labor movement? Genea Martin has worked for more than 19 years at Verizon. As a Brooklyn-based customer-service representative, she helps manage telephone and Internet accounts for businesses. It’s a well-paying job, but at 43 she’s increasingly anxious about the future. In recent years Verizon has shed thousands of jobs like Martin’s without replacing them. Martin is one of nearly 40,000 Verizon workers from Massachusetts to Virginia who walked off their jobs Wednesday, kicking off the largest strike in the United States in nearly five years. An actual strike is a rare event in modern US labor relations—as their ranks have thinned and their opponents become more hostile, unions have been increasingly reluctant to call on members to withhold their labor. And the Verizon strike is massive by today’s standards. In 2015, major work stoppages idled only 47,000 workers, according to the Bureau of Labor Statistics. The striking employees are mostly technicians and customer-service representatives like Martin. They are represented by the CWA and the International Brotherhood of Electrical Workers, and are overwhelmingly based in the company’s wireline division, the old-school side of the telecom business that has declined with the rise of wireless technologies. Employees say the reason for the conflict is simple: corporate greed. Union officials say they’ve already agreed to shoulder a healthy chunk of healthcare costs. But the company is pressing forward with other gut-wrenching demands: Verizon wants to freeze pension benefits at 30 years and have the power to move technicians to sites away from their home states for two months at a time. It is also seeking more authority to outsource work. Negotiators for Verizon want to lower the threshold of calls that are guaranteed to go to unionized call centers, according to Trementozzi. That translates into a labor shift toward non-union employers in the United States and overseas in low-cost countries like Mexico and the Philippines, where Verizon already operates some call centers. Verizon disputes the union’s characterization of its demands. But it acknowledges that it wants greater flexibility to manage labor costs. And for good reason: Last year, the company’s unionized wireline business shrunk by 2 percent, while its largely non-union wireless division grew 7 percent. Wireline remains less profitable than the company’s wireless side, according to company filings with the Securities and Exchange Commission. But the company hasn’t been so tightfisted when it comes to investors. Last February, Verizon announced it would pour $5 billion into share repurchases—that is, buying back its own stock to raise the price and benefit shareholders. The company has neglected to make new investments of that scope in its workforce, employees say. Likewise, it has failed to significantly expand Fios, a state-of-the-art fiber-optic communications network that unions see as the key to the wireline division’s long-term sustainability. Meanwhile, over the past three years, Verizon has turned $39 billion in profits. “It’s not like we’re dealing with a company that’s facing a financial struggle,” says Dalto, the Brooklyn-based customer-service representative. Depending on the outcome, the showdown at Verizon could encourage other unions to adopt similarly aggressive tactics. As union density continues its decades-long slide, labor activist Joe Burns sees strikes of this sort as the only way to revive the labor movement. Despite the nation’s historic level of labor peace, Burns likens the Verizon strike to a recent string of small-scale work stoppages: Last year, thousands of workers at oil refineries nationwide went on strike. So did nearly 2,000 employees of the Wisconsin-based Kohler Company. The battle at Verizon has the fortune of coinciding with a presidential primary process, giving the strike an emphatically larger platform than most modern US labor disputes. As they campaigned ahead of next week’s critical New York primary, both Bernie Sanders and Hillary Clinton visited Verizon picket lines in New York City on Wednesday. Amid the mounting criticism, Verizon CEO Lowell McAdam opted for a public defense of his company. In a Wednesday post on LinkedIn, the executive called Sanders’s views’ “uninformed” and “contemptible.” The senator retorted on Twitter that he welcomed such contempt. At any rate, striking workers are grateful for the spotlight. Genea Martin, meanwhile, is preparing for a drawn-out struggle. Cole StanglerCole Stangler is a Paris-based journalist writing about labor and politics. A former staff writer at International Business Times and In These Times, Cole has also published work in VICE, Dissent, and The Village Voice.